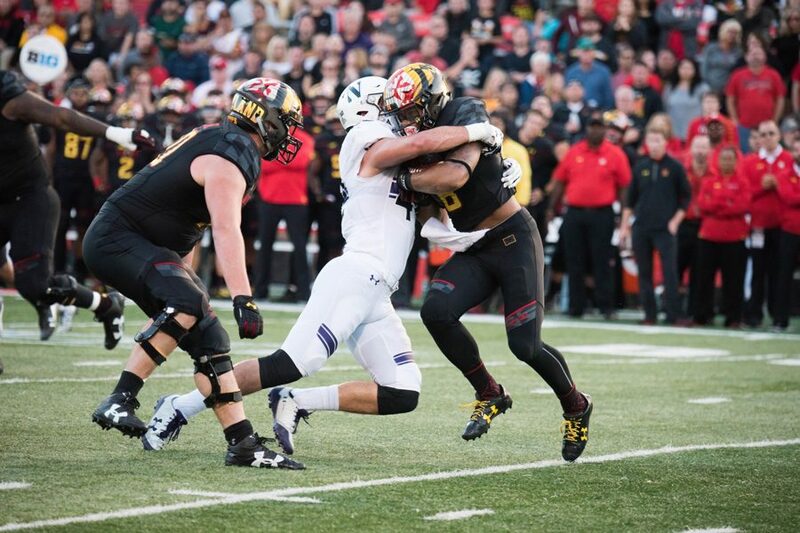 Paddy Fisher tackles a Maryland player in Northwestern’s game against the Terrapins earlier this month. The redshirt freshman linebacker has stepped up this season. He’s no Anthony Walker, at least not yet. But redshirt freshman linebacker Paddy Fisher is doing his best impression of the graduated All-American through Northwestern’s first seven games. Fisher has appeared in every game so far this season and leads the Wildcats with 56 tackles. That’s an impressive total, especially given that veteran linebackers Nate Hall and Brett Walsh trail by five and 16 tackles, respectively. For Fisher, it’s all about seizing the opportunity presented to him. Walker departed with one of the most prolific careers in NU history. The first Wildcat to leave for the NFL Draft before his senior season since running back Darnell Autry in 1997, Walker headed a prolific front seven in 2015 and 2016 before bouncing to the NFL. The Indianapolis Colts selected him in the fifth round in April. But now Fisher appears the heir apparent to Walker’s mantle. The competition for Walker’s spot opened early in training camp, Fisher said, and about two days before NU kicked off its season against Nevada, linebackers coach Randy Bates informed Fisher he’d won the job. Fisher said he spent extra time going over tape and doing extra reps with sophomore linebacker Nathan Fox, one of his close friends on the team. Having a teammate like Walker, even if only for one season, was a huge benefit for Fisher, the redshirt freshman added. Fisher appears to have locked down the middle linebacker spot, at least for the time being. True freshman Blake Gallagher has started amassing playing time, but only to give Fisher a breather. But looking ahead, Fisher said he only wants to improve.